Include customer data inside of your video content to drive engagement and increase conversions via personalized experiences and offers. You may personalize the content of your vooPlayer videos. A new menu button has been added next to every field in vooPlayer which can be personalized. 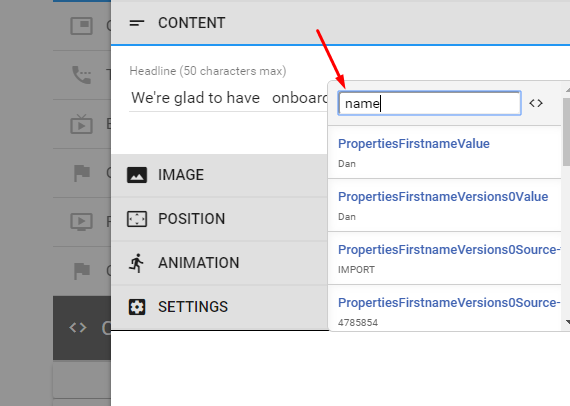 Opening it will bring up a list of predefined keys as well an option to create custom keys. Each provided key can also have a specified fallback value in case the key value is not provided for any reason. But how do we get this data to replace the keys? There are two supported methods for providing the customer data. First you can check this simple video walk-trough of connecting and setting up personalized data in a vooPlayer. This will demonstrate both methods. Storing data in one centralized resource is a common practice today in marketing. This is why we are enabling you to connect your CRM or Autoresponder and leverage connected data it in vooPlayer. To connect to an integration you can simply select the integration from the Personalized Data option under Settings > Advanced Options. This will be an integration you should have already set up. If you have not set up any intergrations yet, please see this article. Once you select your integration you can provide a sample email with which to fetch the integration keys with. Please note this is an email that should be an email that is in the system you chose. So if you chose your Hubspot integration, the email you choose for the sample should be an email in your Hubspot data. After you enter the email, click on "Test Integration" and it should return lots of data. If it does you are all set and can click "Confirm". Choose the key value you want to add. You can add multiple values. Then, all you would need to do is provide their email to the URL of the vooPlayer page video. When you do that, it will pick up all the data for that particular contact for your personalization keys. 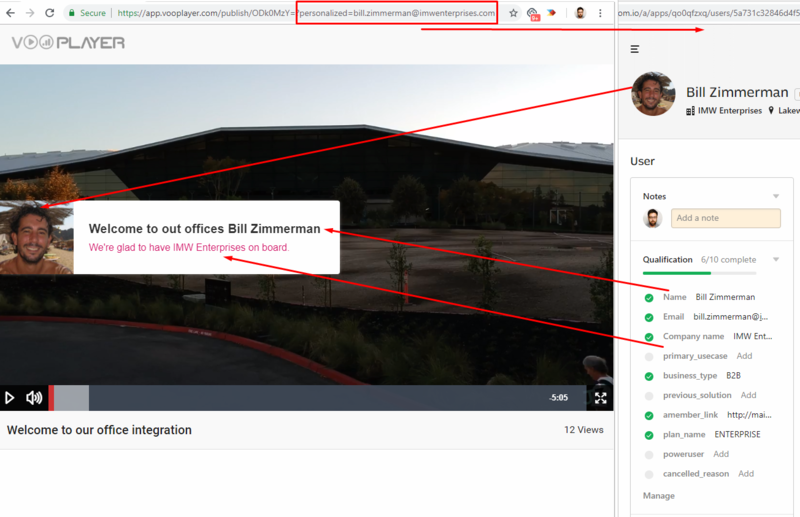 If the connected integration supports tacking events, we will forward the viewing data for that session back to the CRM / Autoresponder so that you can leverage it in further automation / segmentation efforts. To let us know what provider we should add next, please submit your feedback for consideration. 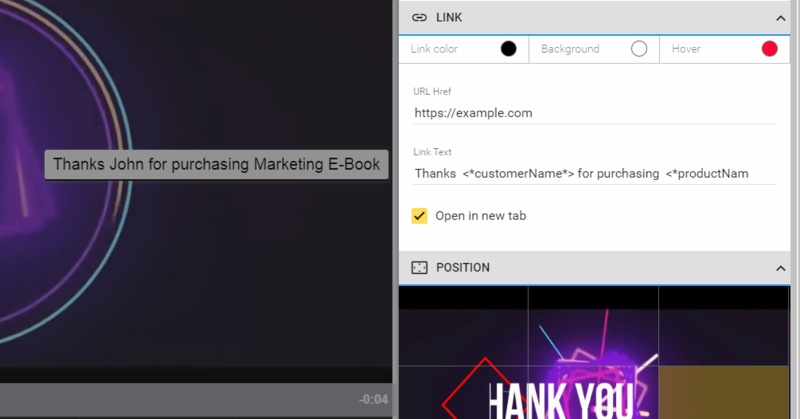 If you can pass along data captured in a previous step of your marketing funnel to the next step, or if you can send someone a link with a custom parameter in the URL, then you can personalize the viewers experience. and by including custom customerName and productName keys in the your vooPlayer overlay you would get a personalized message. To let us know where you would like us to expand personalization to, please submit your feedback for consideration.